Even if you have a compact house, there are a few décor hacks you can utilize to give your place the feeling of space. The first notion is definitely the placement of furniture. The luxury furniture options in Delhi, Mumbai, and other cities include a range of choices, especially Italian furniture in India like Italian wardrobes, Italian cupboards, and Italian closets, especially among luxury Italian products. Then there are options like the right color palette, items of décor on display all of which have their own individual impact. Rethinking your room décor, especially the living room which is the special social zone and does give the foremost impression of the house, greatly determines the space element in the house. These home décor tricks will make sure that you have the element of space in the house, whether it is space or just an illusion of it. Stuffing in too much furniture in a room is not the ideal answer to making it cozy or comfortable. It rather makes the room feel smaller. In this case, so that all needs are adequately fulfilled, you can go for furniture that serves more than one single purpose. Coffee tables, for instance, are not only handy but also decorative. Ottoman can be used as a footrest, or a coffee-table itself or also extra seating. A coffee table can also be used to make a statement along with its usage. Other than that, Italian cupboards, Italian closets, and European wardrobes also act as multipurpose furniture. As far as colors go, they make a great impact. One can have the same furniture pieces in the same color palette as the walls. Often large pieces of furniture tend to blend in with the walls, hence using the same color in uniform with the walls visually enlarges the available space. Using matching colors of the fabric used in cushions and pillows in especially your Italian sofa further maintain the continuity, balancing the theme. The secret is in the layout! Planning the layout of the room, where the furniture and other variables should be, is an important aspect of the space factor of the room. To demarcate a room for an open-plan living and dining zone, a simple strategy is to add a piece of décor, like a rug that lines along the Italian sofa for instance. In a longer, narrower space, an Italian sofa can be placed to create a natural pathway. Using a coffee-table with a glass top also gives the impression of space. 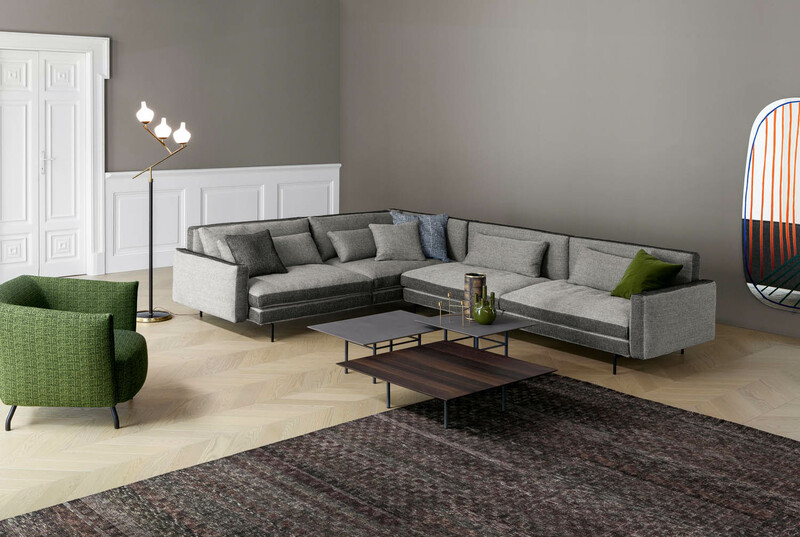 An L-shaped sofa acts multipurpose; it provides seating as well as may act as a separation between the living and dining spaces. There is a floating effect with such kind of furniture, especially if it is a wall-mounted console, it helps avoid clutter at the same time and makes the floor seem wider and cleaner. Although the most basic thing, hanging a mirror on the wall creates the illusion of space in a room. It bounces the light around the room and makes space appear larger and brighter. In the framing prospects, if the length of the mirror matches the size of the Italian sofa, then a perfect symmetry is created. You can always opt for a wall-mounted cupboard to save space. In fact, floor-to-ceiling bookcases have the potential to convert the living room into a cozy library space. But the idea is to keep the theme neutral because a cupboard-full of books is always a riot of colors. A structured color-code gives a much cleaner organized look too. Built-in sofas can also do the trick and ensure that no space is wasted. A built-in unit appears to be suspended in the air making the room seem larger. The idea is to use the space under the staircase which often goes wasted, but this customized space works wonders! You can make it into a seating area by adding a leather Italian sofa which fills up the compact zone perfectly, while the stair railings help space appear lighter and spacious. By following these simple home decor hacks, a room can be made more spacious. Other than that the using of stripes, in wall-paper or in furniture fabrics, elongates the space, painting or putting an wallpaper on the ceiling, or simply moving furniture away from the walls also helps in rendering space.